At your latest parent teacher conference, your child's teacher may have addressed your child's reading level. Today, let's chat about reading levels. There are a few many ways to level books. How often have you picked up a book at the library that says, "Level 1"? Knowing that your child's teacher said he was a level 6, you think, this will be an EASY book for my child. Unfortunately, you get the book home and your child can't make it through the first page. Sometimes the levels don't line up. It's good to ask your child's teacher which levels are being used. You can often find the publisher's level on the back of paperback books. You might see 2.1. This book is designed for students in second grade, first month. This is sometimes referred to as grade level equivalent. Publishers sometimes mark books by age also. The problem with these markings is that children in a certain grade or a certain age may vary widely by reading ability. Accelerated Reader (AR) is a reading program used in many schools. Children read books on their level and take quizzes. The good thing about this program is that it provides a level to parents. Many libraries have their books marked or their catalogues marked so finding books can be easy. However, most schools don't use AR with their early readers so if you have a Kindergartner or first grader, you may have trouble. Using the Lexile measure to determine text level has always been a popular leveling system but has grown increasingly popular as these measures are mentioned in the Common Core State Standards. Students take a test to find their lexile reader measure. 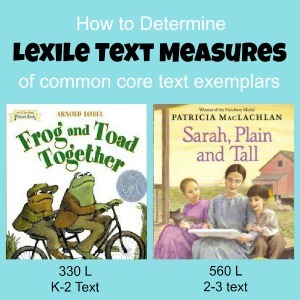 This level is then correlated with books that have been leveled with a lexile text measure. 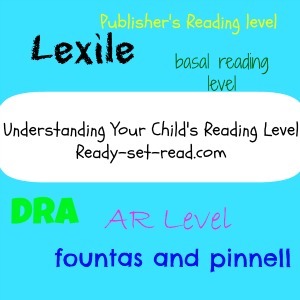 If your child is given a reading level with an "L" at the end, he or she is probably working with a lexile level. A beginning reader will have a level of BR. The Common Core curriculum has a list of several exemplar textsin Appendix A. These are the types of text levels students should be reading in certain grades. For example, the book, "Frog and Toad Together" has a lexile level of 330L and should be read in K-1, according to the common core. While Sarah Plain and Tall has a lexile of 560L and should be covered in second or third grade. If you want to know the lexile level for a book (say for the text exemplars mentioned in the common core), a good tool is the Scholastic book wizard. You can type in any text and choose lexile and it will give you a lexile level for the text as well as other text within the same lexile range. (You can also use this tool for DRA, grade level equivalent, or Guided Reading Level). If you know your lexile and would like to find books within that lexile range, you can visit this helpful resource on lexile.com. You can search within a lexile range and choose the types of books that interest your child. The DRA is one of the more common early childhood assessments being used right now. The DRA gives your child a number score and the books are leveled accordingly. An average first grade reader in November is probably reading between a level 8-10. The Fountas and Pinnell Guided Reading Levels are very popular in schools in my area. Many of the schools give the children the DRA and then convert that into a lettered level. If your child is reading between A-I and is a kindergartner or first grader, his school is probably using the Fountas and Pinnell Guided Reading Levels. Basals are a teacher term for reading book. When I was in school, everyone in first grade read from a first grade reading book, no matter what level the child was reading. The basal reading levels are scored early, pre-primer, primer, grade 1, grade 2, etc. As you can see there are many ways to level text. It's a great idea to ask your child's teacher what leveling system the school is using. This will help you as you search online for books or when you visit the library. I know our library has the Acclerated Reader lists available to search on the computer along with the general library catalog. This is helpful since so many schools in the area use the AR program. Take time to discuss your child's reading level with your child's teacher. Ask the teacher which leveling system the school is using. Use your local librarian as a resource. He or she may have access to book lists that can help you find the best books for your child within his or her reading level. One last thing to remember, no matter what "level" your child may be reading, make sure your child is exposed to a wide range of reading materials. Let your child re-read easy books to build confidence and understanding of print. Read aloud harder materials to your child. Let your child try to read things that may appear to be "too hard" for them. Even if they only read the parts they know, they are being exposed to wonderful new things. Children will notice so many more things about text, words, syllables, punctuation, etc. when they move beyond the early text levels. Most of all, have fun reading with your child. Reading at home should be enjoyable! Great post! My kindergartner's teacher said he was reading at AR level of 2 to 3 which seemed different than some of the books I was buying. Thanks for the info! Hi Alissa here from Excuse Me Mrs C! Great blog, really valuable reading information and ideas. Thanks for the list of books. If we have time today, we will head to the library and see what we can find. I never made it to the library but did go through a drawer of books upstairs. Nick read all the way through "A Kiss for Little Bear". We did a picture walk first. I also found a book from you called "Dinosaur for a Day". Nick kept telling me I love this book. Of course, I read that one to him and Alex. It was nice to find 'new' books in our own house. You've done a great job describing how different leveling systems are used. I've addressed this topic on my blog also. There's a link on my blog to my Amazon Store with some of my favorite books grouped by DRA level. Keep Books are made by the developers of Reading Recovery. They are leveled and very affordable. You may want to look them up online.